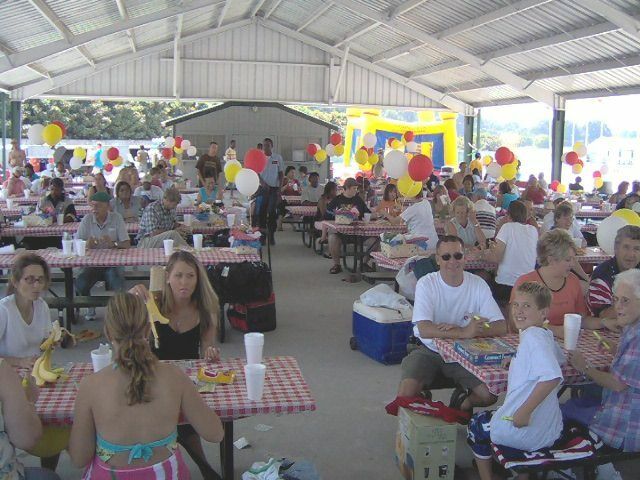 Company Picnic Atlanta – This guide will help you to plan a successful company picnic in ten steps..
Picnic budgets range from $25. to $100. per person, depending on location, food and beverage, entertainment and giveaways. Food will often comprise 50% of the budget, 25% to entertainment, 15% allocated to the location rental (if needed), and the balance of 10% to giveaways, prizes, and decorations. These amounts will vary depending on your organization’s preferences and whether the event is employee-only, or open to families. The date of your company picnic Atlanta event may be determined on the facility and vendor availability. Often this step is planned at least two or three months in advance, especially if it’s a popular time of the year. Here in Atlanta, June through October is considered picnic season. Most picnics start around ten or eleven in the morning and end around three or four in the afternoon. Some companies will schedule their event on a weekday, while most will have their picnic on a weekend. The location you select should be easily accessible to your attendees. The facility should also be able to accommodate all your guests, food and beverage, entertainment and your attendees comfortably. Some facilities, such as private event facilities, will not allow you to choose your own caterer, and you’ll be limited to the selection offered. Parks are usually the preferred choice in Atlanta, with ample space for activities. Larger companies may even choose to have the picnic onsite, to save money. When you’ve decided on the theme for your family fun day, it’s time to get creative. Invitations, decorations, costumes, food, and entertainment should all fit the theme chosen. Food is critical to the success of your event. Everybody remembers the food. Make sure to choose a caterer that has experience in company picnics. The most popular company picnic Atlanta food choice is BBQ, and the best barbeque restaurant in Atlanta (as chosen by the Atlanta Journal/Constitution is Sam and Dave’s BBQ2 (770-792-2272), owned by David Poe. They have excellent catering services as well, and I’ve known David for over 25 years. It’s also wise to plan healthy options and vegetarian choices in your food selection. While it may comprise a small percentage of your employees, my experience has shown that they are a vocal group and will complain if there is no non-meat options in the menu. Also, you will need to decide about offering alcoholic beverages. You will need to have designated drivers to assist those who have overdone it. People expect entertainment and fun at their company picnic Atlanta event. The most popular inflatables include Moonwalks, Giant Slides and Obstacle Courses. 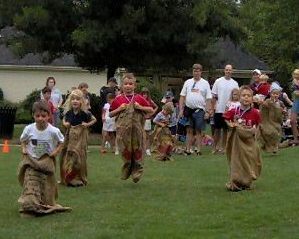 Picnic games, such as potato sack races and water balloon tosses are always a hit at company picnics. The most popular entertainers include DJ’s, Magicians, Clowns, Caricature Artists, and Face Painters. While a DJ is not necessary, having a sound system for announcements and any awards or prize giveaways is beneficial and especially recommended if you have more than 100 attendees. Clowns and Face Painters are invaluable in entertaining the children present. Magicians will often be able to perform strolling magic, or put on a stage show for your guests. A Caricature Artist will be able to provide a keepsake for your attendees. Other choices include Fortune Tellers, Handwriting Analysts and Jugglers. Atlanta has many choices when it comes to entertainment and amusement rentals for company picnics, but the most-recommended is Funtastic Events Inc (770-867-7044). They’ve been around since 1985, providing entertainment and amusement rentals for company picnics all over the Atlanta metro area. Team Sports Volleyball and Softball are two of the most popular. Some companies even have different color t-shirts made up for each team. Bingo Bingo is always a popular choice, especially among the most sedentary attendees. Most bingo activities last about two hours at most picnics. Miniature Golf The facility may have a miniature golf course, or you may have to rent one from your vendor. This activity is appropriate for all age groups. Swimming Swimming is very popular, especially in the hot summer months. Many parks will have a beach or swimming pool available for your attendees. Some, such as The Beach in Jonesboro, will also have a couple of water slides. Contests Contests always bring excitement to your event. Many picnics will have cooking contests, such as the best dessert or decorated cake. Others may have a company trivia game, in which individuals or teams compete to see who has the most company or general knowledge. A theme makes it easy to choose all of your food, decorations, and activities. With most company picnics it’s easy to decorate. Put up some balloons and other theme decorations available at party stores. The number of prizes to be given away is often based on the number of attendees, in addition to the budget supplied. Often, many organizations may have donated prizes from their vendors or members. A nice Grand Prize will often attract more attendees to your event. Typical prizes may include dinner certificates, a day off (with pay, of course! ), barbeque grills (George Foreman seems to be the most popular), digital cameras and ipods. It is typical to give away most of the prizes at the very end of your event. Many times the committee members that organize the company picnic volunteer their time and efforts. It’s often a thankless position. People appreciate being recognized for them for their hard work. Conducting a survey after your event will help next year’s committee plan their event. Find out what the attendees enjoyed most and what they would preferred the least. Good luck on planning your company picnic Atlanta event.